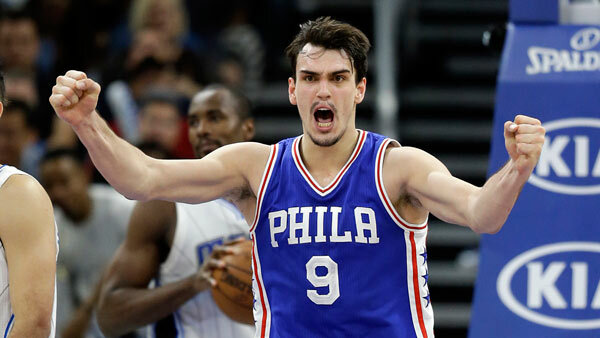 PHILADELPHIA (WPVI) -- Philadelphia 76ers forward Dario Saric has been named the NBA Eastern Conference Rookie of the Month. Saric, nicknamed "The Homie," leads all NBA rookies in points and rebounds per game in February. Saric is the second 76ers player to win the award this season, joining center Joel Embiid (October/November, December and January). The last team to have two different winners in the same season was Milwaukee in 2007-08. Saric averaged 17 points, eight rebounds and three assists in 30 minutes per game in 12 February contests. He scored in double figures in 11 of 12 those games, including five 20-point games. No other rookie had more than two 20-point games, while the entire rookie class outside of Saric totaled seven such games. Saric is the fifth 76ers player to be named Rookie of the Month since the award's inception in 1981-82. He joins Embiid (three times in 2016-17), Michael Carter-Williams (four times in 2013-14), Allen Iverson (twice in 1996-97) and Jerry Stackhouse (once in 1995-96).